Fourth Row Center: Film Writings by Jason Bailey: On DVD: "The Town"
Fitzgerald famously wrote that “there are no second acts in American lives,” but Fitzgerald wasn’t a film critic. He might have revised his opinion had he witnessed the somewhat spectacular resurrection of one Ben Affleck, who went from Oscar winner and must-have leading man to overexposed pop culture punchline in the space of about half a decade. Some of this was his fault (he certainly didn’t have to make Surviving Christmas, or Paycheck, or that cameo in then-girlfriend J-Lo’s music video), and some of it wasn’t, but Affleck did just about the smartest thing he could’ve done—he went under the radar. Onscreen, he limited his appearances to compact character roles; off-screen, he cast an eye towards the future, co-writing and directing the critically-acclaimed 2007 adaptation of Dennis Lehane’s novel Gone Baby Gone. Affleck didn’t appear in that film, handing the lead role to his kid brother Casey (who did some of his best work to date). 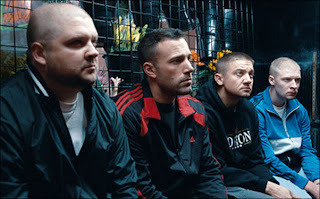 His directorial bona fides established, Ben cast himself in the leading role of his follow-up, The Town, another tale of workaday Boston criminals (this one adapted from the novel Prince of Thieves by Chuck Hogan). The picture’s ads were strangely schizophrenic, trumpeting it as the work of “the director of Gone Baby Gone” as if he’s not the same guy doing chin-ups in the leading role, but hey, whatever works. Affleck plays Doug MacRay, a theoretically smart guy who may very well have been born to the wrong father—a career criminal (Chris Cooper)—in the wrong neighborhood: Charlestown, a working-class area of Boston that’s been dubbed “the bank robbery capital of America.” Doug’s crew is tight-knit and adept, as we see from their polished execution of a bank job in the film’s opening sequence—but an alarm gets tripped, and Doug’s hotheaded sidekick James (Jeremy Renner) takes manager Claire (Rebecca Hall) along as insurance. They get away clean, but James insists they keep an eye on the girl. Doug volunteers for the job, but finds himself drawn to her, almost helplessly. There’s a connection; they like each other, and he finds himself imagining a life with her, away from Charlestown. As far as his own performance, Affleck quietly reminds us that he is an actor of considerable but understated gifts, when not saddled with unfortunate dialogue and Bay-level direction. But he seems an uncommonly generous actor/director; in his two-scenes with Hall, for example, he usually seems more interested in showing us her reactions to his lines than his own close-ups saying them. In observing the quiet power of his own performance and the skill with which he draws top-quality work out of his collaborators, we can’t help but reflect on the recent comments by Affleck’s friend Matt Damon, who sees parallels between Affleck and his most recent director, Clint Eastwood. There’s certainly a similarity in the two filmmakers’ work (and not just in the obvious example of Eastwood’s Boston-set Mystic River)—he’s a smooth, assured, professional filmmaker, equally agile in character-driven dialogue scenes as in action sequences. His work here doesn’t quite match his previous directorial effort; the film lacks the intrinsically compelling mystery elements, to say nothing of the climactic emotional wallop, of its predecessor. But his action beats are first rate, from the tense robbery that opens the picture to the taut, low-to-the-ground car chase midway through to the crackerjack heist and shoot-out at its climax. The Town drags a bit in the second hour, but even when its energy flags, its rather remarkable how cleanly Afflect pulls his story taut. There’s not a surplus of spontaneity to it; the scenes unfold pretty much as expected, but even the flatter, purely expositional sequences have touches around the edges that give them an extra snap. Whatever its minor flaws, The Town is a fine-tuned, crisp piece of genre filmmaking, and proof positive that Affleck’s last turn behind the camera was no fluke. "The Town" hits DVD and Blu-ray on Friday, December 17th. For full A/V, bonus feature, and "extended cut" details, read this review on DVD Talk.